VISITING SANTA, AS magical as it is for families, can oftentimes prove somewhat stressful, with loud noises and long queues. This sort of an environment can be particularly difficult for children with Autism to cope with. So, with that in mind, Winterval, Ireland’s largest Christmas festival, is hosting an Autism-friendly evening on Thursday 13 December at the Old Postal Sorting Centre in Custom House Quay. 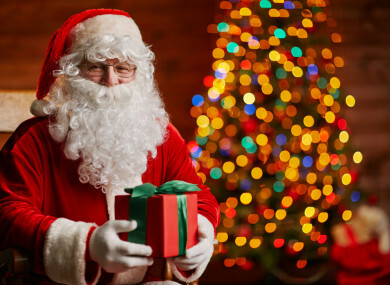 On the evening, children with Autism will get a very special experience with Santa Claus. The event is designed and adapted for children with special needs to meet Santa in a calm environment. Staff will fully brief each group in advance of their experience at Enchanted Christmas to ensure they are fully aware of what to expect. A Santa who has experience working as a ‘Sensory Santa’ will be available on the night. “He’s used to dealing with kids on the spectrum and interacting with them both via his hand signals, his gestures and the way he interacts with them by way of speaking with them at a slower pace,” Craig Lee of Momentum Events, creators of the Enchanted Christmas event, told TheJournal.ie. The aim of the evening is to create a calm and relaxing environment, providing a stress-free evening for all guests. To ensure this sort of an environment is created, the design and visual aspects of Santa’s grotto will be modified. People with Autism can sometimes struggle with certain sounds, smells and textures. This was taken into account for the grotto adaptations. “We’re basically eliminating the sound element,” Lee said. The grotto usually has Christmas music playing in the background, but this will be turned down on the night. “We’re basically going to tone the whole thing down and pull all the volume down,” he said. Games of a sensory nature, such as soft play, will be available in the grotto for the children. The layout of the space will also be adapted to make it more accessible to all. “In terms of accessibility, we’re reconfiguring the space just to make it as accessible as possible for everyone,” Lee said. The 2018 Winterval Festival kicks off on 17 November from 4pm. A giant post box for Santa letters, situated at The Applemarket, will see free special performances from the Waterford Academy of Music and Arts every Saturday and Sunday afternoon during the festival. Tickets for the Autism-friendly event are limited and further information is available here. Email “This Santa's grotto is being adapted for an Autism-friendly experience for children”. Feedback on “This Santa's grotto is being adapted for an Autism-friendly experience for children”.